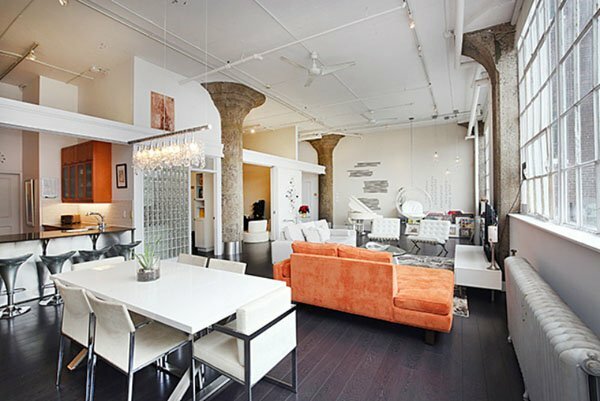 The Wrigley Lofts encapsulate New York City style loft living, with expansive windows and massive concrete pillars. 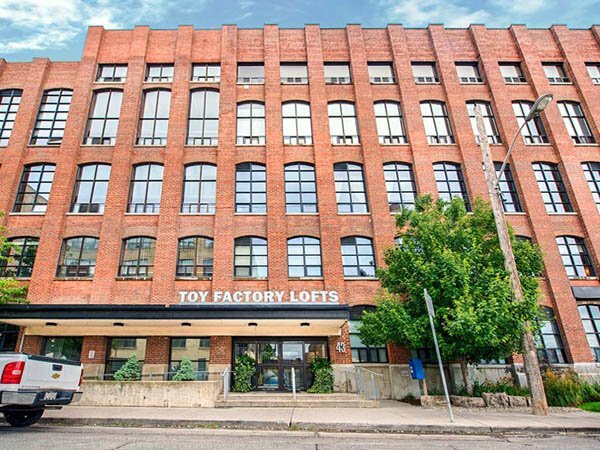 One of my personal favourite lofts in Toronto, the Wrigley Lofts were converted from an old Wrigley gum factory (duh), just north of the Garment Factory Lofts and Printing Factory Lofts, across from the i-Zone Lofts. 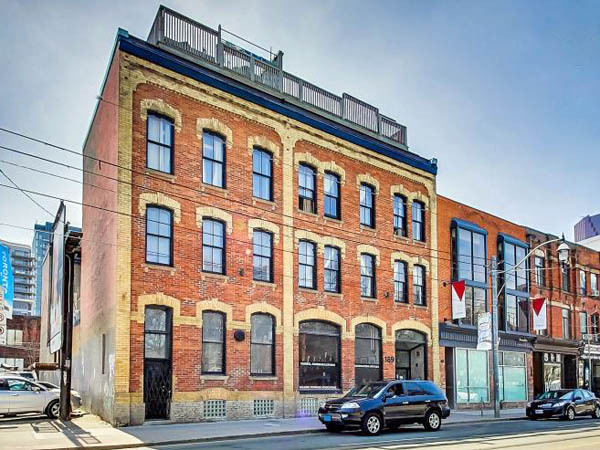 This is the most loft-dense part of Toronto with 4 amazing loft conversions on the same block. 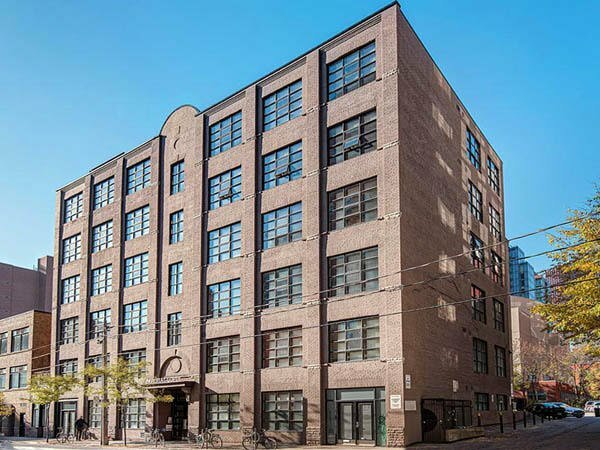 Located in the studio district part of Leslieville, the Wrigley Lofts are true open concept loft spaces with 16-foot ceilings and concrete floors, mushroom columns and ceilings. 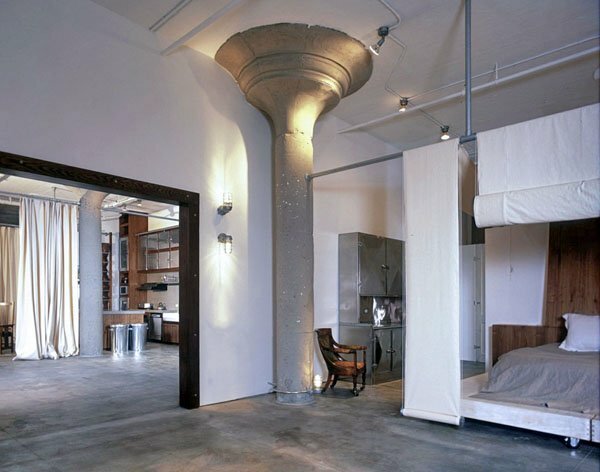 The Wrigley Lofts are huge open spaces with large fluted columns and warehouse windows – these are classic New York-style hard loft spaces. Many have mezzanine bedrooms, with a variety of different staircases. No outdoor space with any unit, though, and all of the parking is surface. 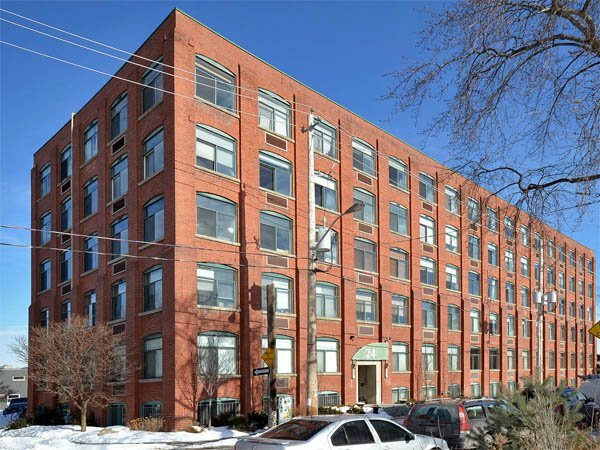 Wrigley Lofts is just north of Queen Street East on the east side of Carlaw Avenue. 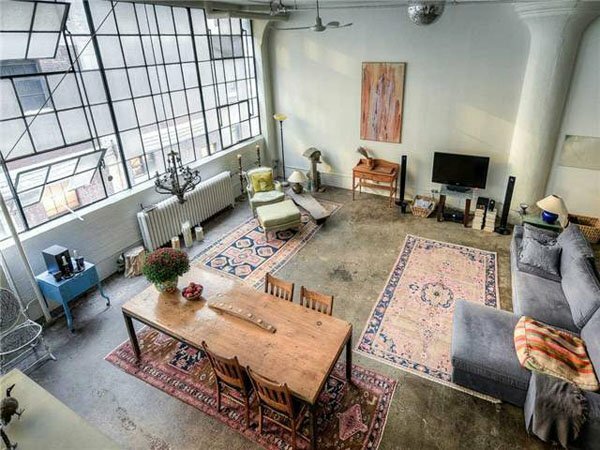 Many building projects use the term “loft” as a marketing term, but these are the real deal – a converted warehouse turned into vintage hard lofts. They even have street cred as an artists’ squat. 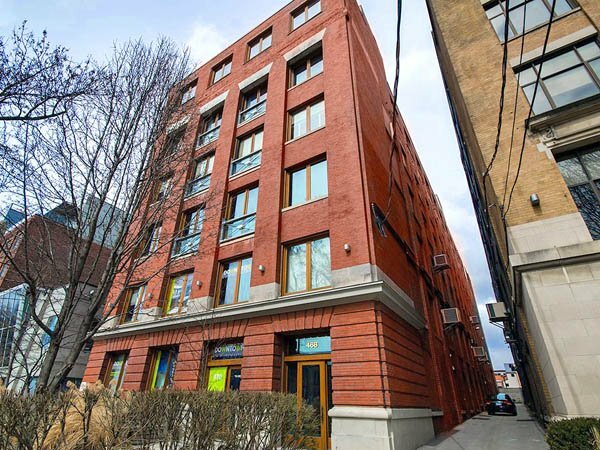 A long time ago I was showing a unit that was listed by the original sales agent for the conversion. 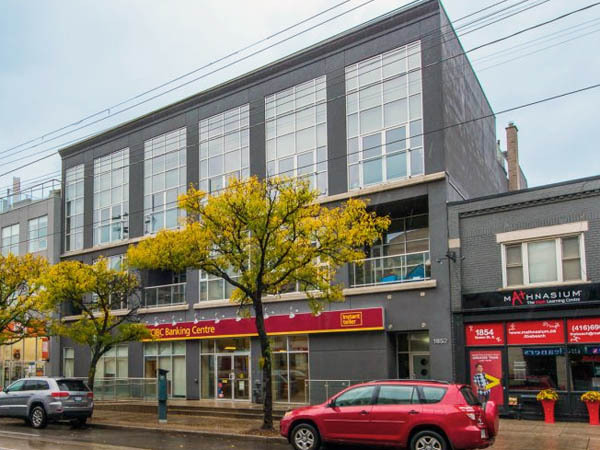 My client was looking at a unit being carved out of the smallish extension on the north side of 245 Carlaw, which was converted years after everything else. Had been rented long-term, I believe. 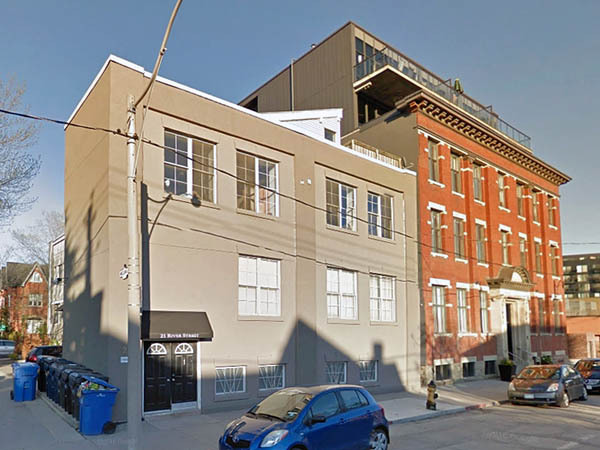 The agent told me a story about selling lofts at 245 Carlaw as studio space a long time ago. I remember her telling me it had been vacant, had been some sort of artists squat with people living and working there not-quite-legally. I think this was in the 1980s (Wrigley had left in the 1960s). She said that they basically drywalled and separated the spaces the artists were already using and sold them for something like $80-90k. This would have been before the “official” conversion in 1999. There is no way to know the truth of it, she is not returning my emails. And I am just going on memory of a meeting from 2007 or so. Connected to all of is another memory, that the zoning was left commercial for the longest time. Not sure if it was the agent, or it was an architect I spoke to at length years ago who told me tales of family infighting over land and lots and whatnot. Someone else who is not getting back to me to help me confirm things… But this means that everyone was living there illegally, but the city allowed it, grandfathered them in as it were. This would be because people moved in in the 80s and squatted there, then the non-official “sale” of studios that were not necessarily for living in. Then the “official” conversion in 1999. But through all of that, it seems it was never converted to residential zoning. 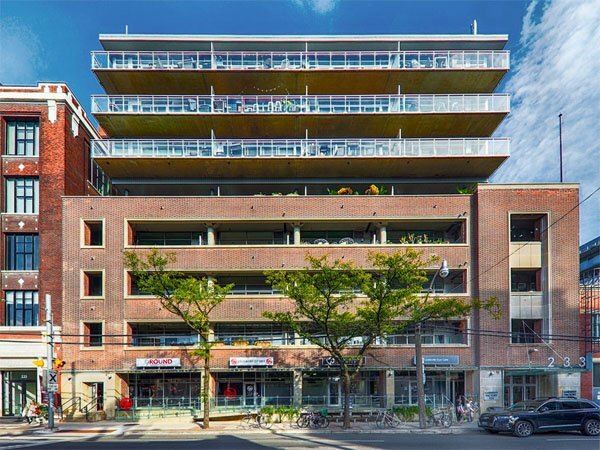 Led by said architect, the residents got together early in the 2000s and got the proper zoning. Good lord, how can you not fall in love with spaces like this? 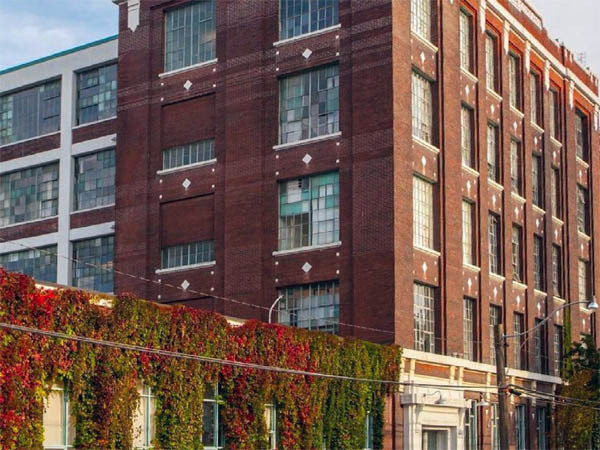 With true live-work zoning, the Wrigley Lofts are a haven for creative types. 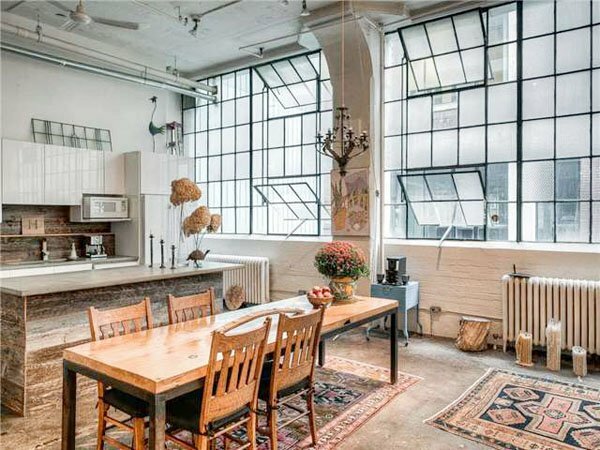 One of the only loft buildings with 1,400 to 1,600 and 2,000 square foot lofts, the light and the windows are amazing for painting and photography. But now the prices are starting to get up there. 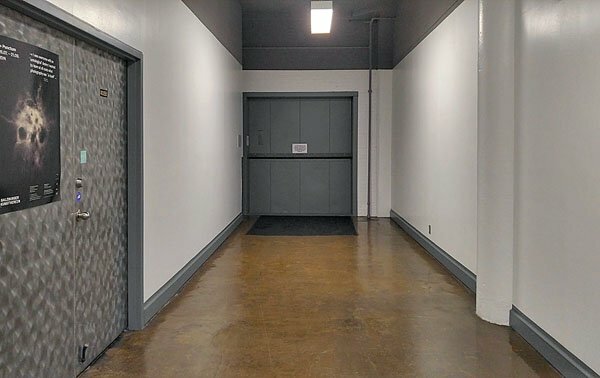 There are some weird windowless work-only units in the basement that are much more affordable, but you cannot live in them. 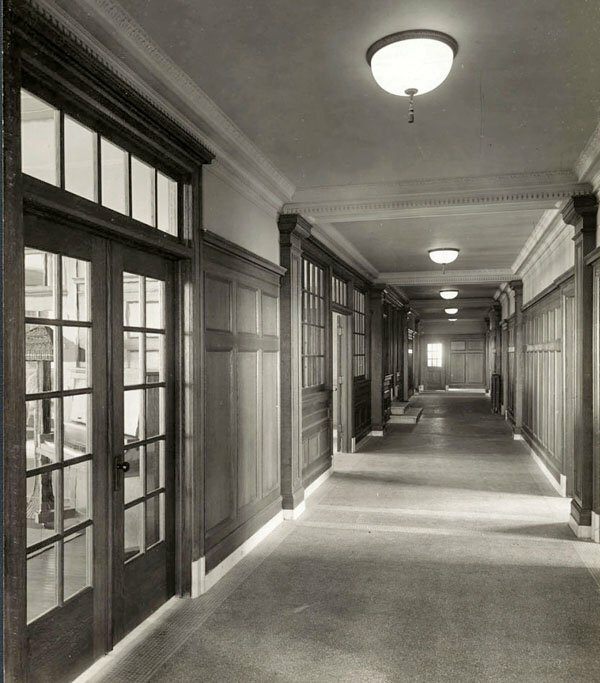 The amazing marble lobby is pretty much original to the way it looked 100 years ago. The elevator is too, you will know the first time you step into it. That odour of machine oil is the smell of history! I have heard a lot of people talk about the uniqueness of individual suites, but to be honest, they are all pretty similar. Not a bad thing, but there ain’t a ton of variety. But why mess with a good thing? 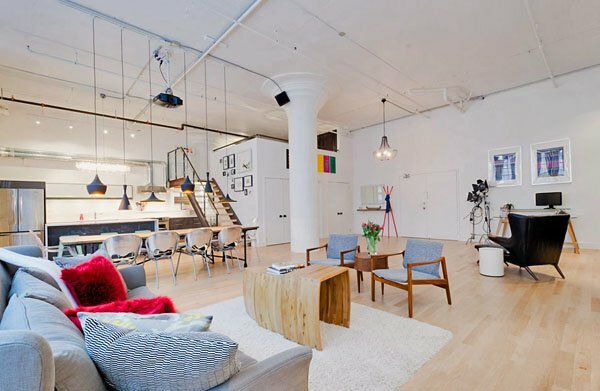 Big cubes of open space, that is the whole point of a loft. 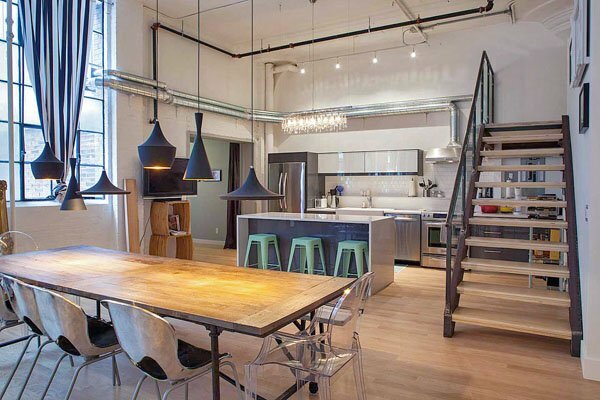 Some have mezzanines, some don’t. 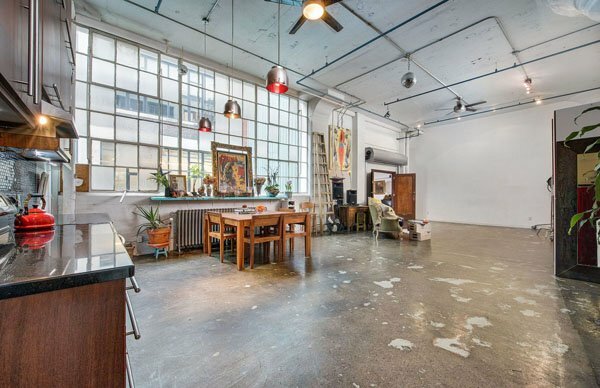 All have mushroom columns, concrete floors and massive (if drafty) warehouse windows. 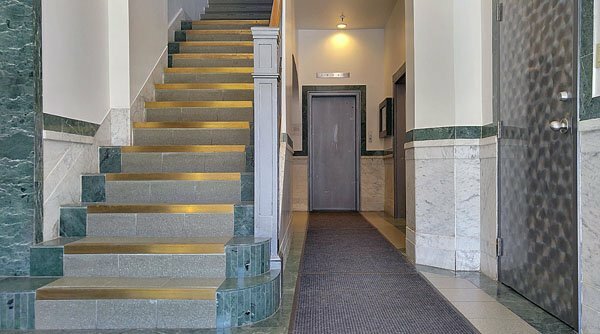 Some of the units feature wide double entry doors and in many of the units sleeping lofts have been constructed, some with metal spiral stairs. 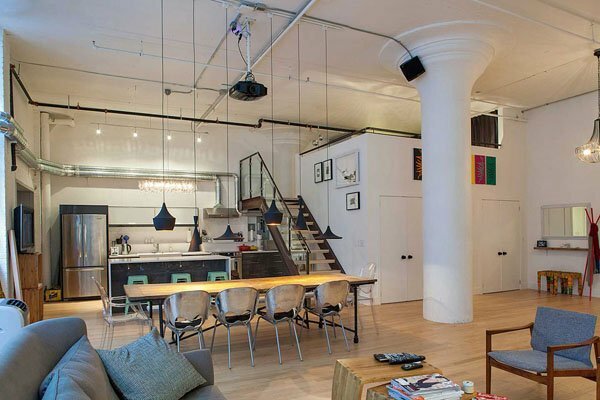 This is a truly beautiful conversion. Units that are attached to the “bridge” between the 2 buildings have add-on rooms. I have seen them turned into bedrooms with awesome roll-up doors. 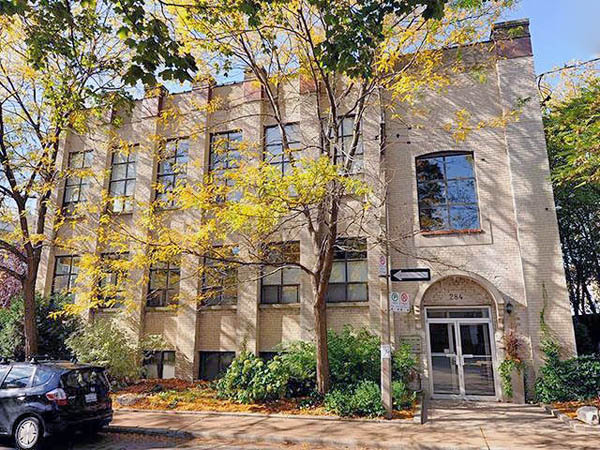 There was a unit owned by a somewhat famous musician who used that space for a jam room. Heck, I have even seen motorcycles in more than one unit. 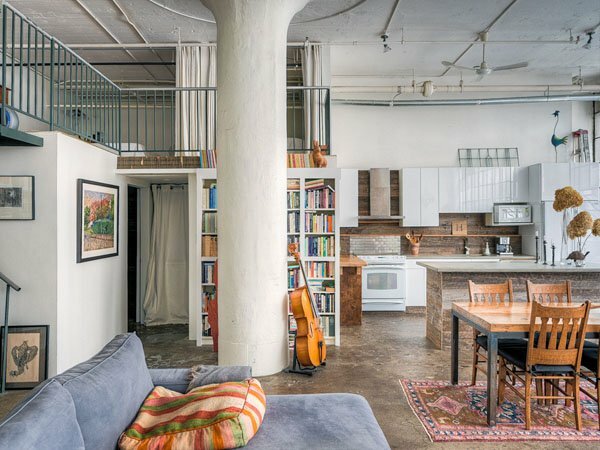 These lofts are rock and roll all the way. 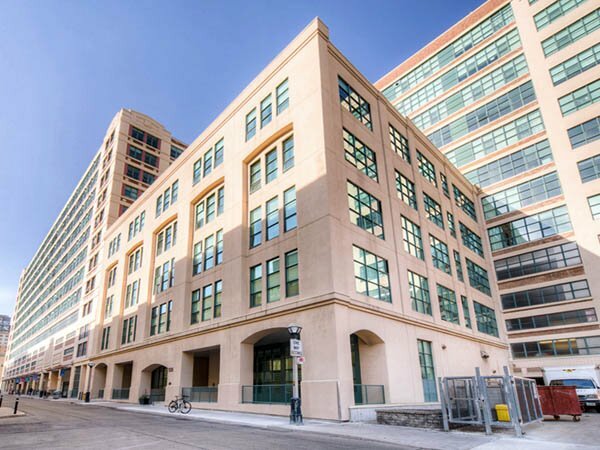 The 5-storey Wrigley factory was converted in 1999, and the one-story north extension in 2007. 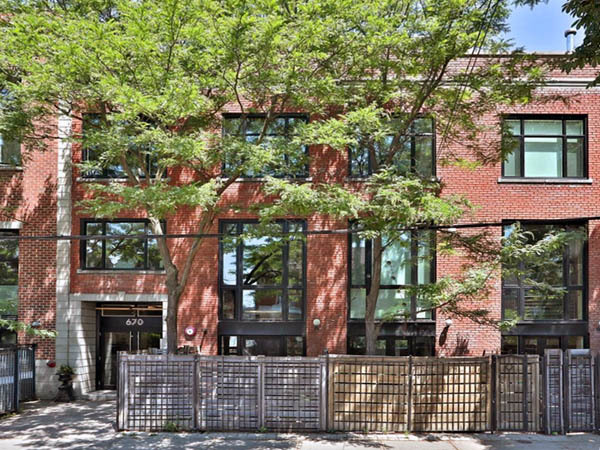 The first listings appear on MLS in the summer of 1999, with the seller listed as 814803 Ontario Limited. Not many from the builder on MLS, mostly it was private people selling almost from the get go. 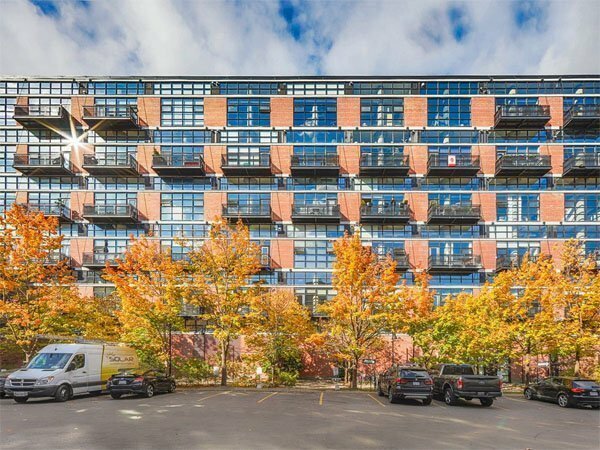 The story had always been that Atria converted it, but there is no mention on their website. 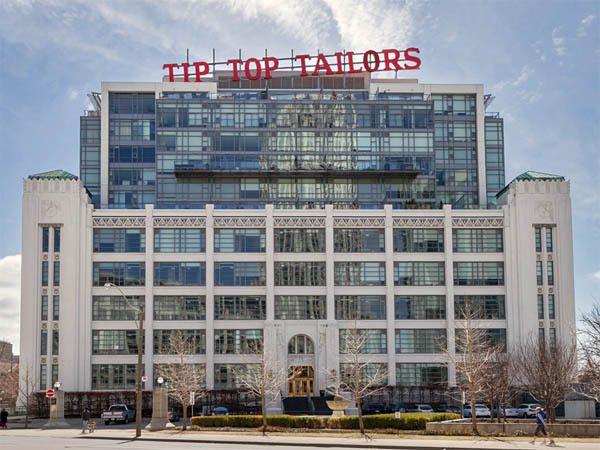 They did the i-Zone Lofts and the Garment Factory Lofts, and take credit for both. 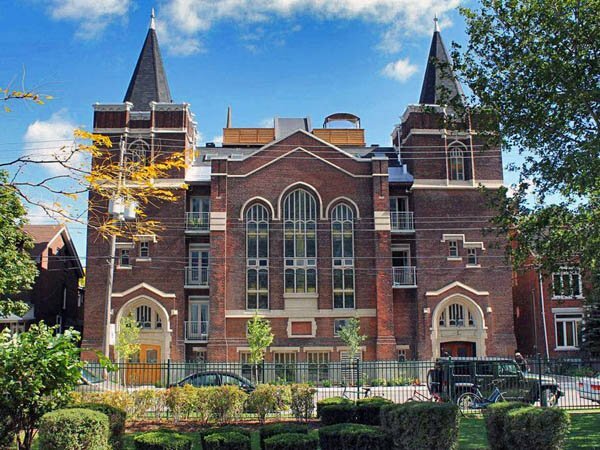 I think it is safe to assume that they did NOT do the Wrigley Lofts conversion. 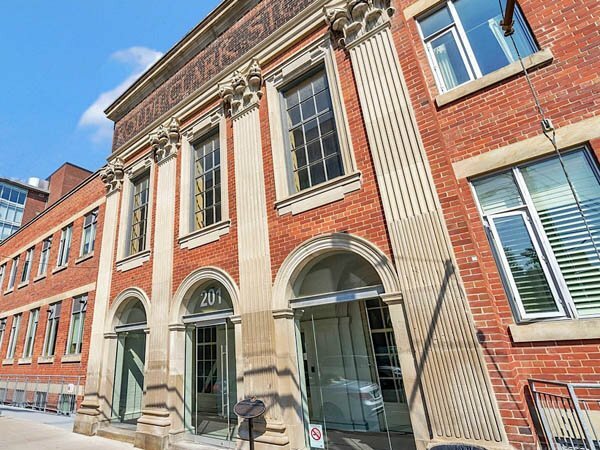 The Wrigley buildings on Carlaw, looking north, with the Rolph Clark Stone building to the south. 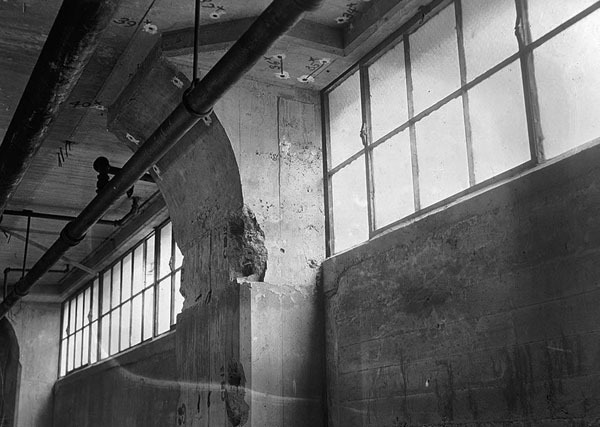 Note the Garment Factory had yet to be built when this photo was taken in 1948. The alley between the two buildings with the “bridge” above. In this photo you can see the single subtle difference between the two buildings, the red brick first floor of number 235. Which brings me back to the conversation with the architect. He told me about some sort of fight two families were having. They had owned vast swaths of land in the area for generations. There was some sort of fight about one owning a piece of property that the other wanted, but they would not sell. So the one rented out their bit to a company that parked their trucks there. I don’t remember all the details, but I do remember seeing the trucks at the back (east) end of the parking lot for years. But enough rumours. 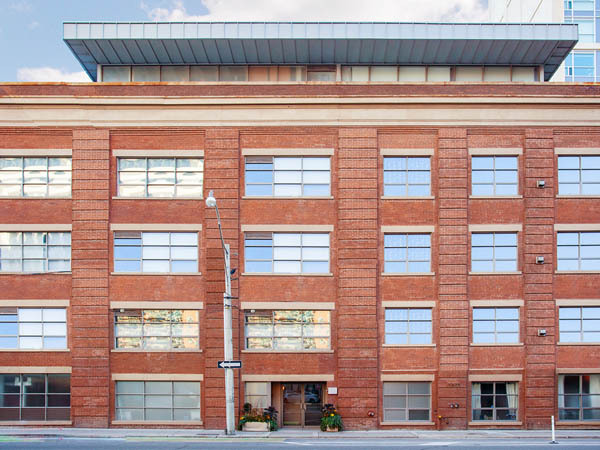 The Wrigley Lofts were converted from north building only, the south building at 235 Carlaw is still commercial. Many say that it was built in 1907, but it wasn’t. 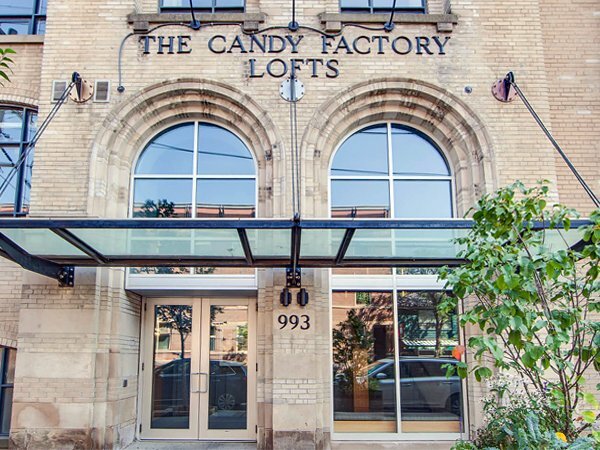 Not the first time the Toronto real estate community had gotten the details of a loft wrong… I think people are confused, as 1907 is the year when William Wrigley Jr. first came to Toronto. 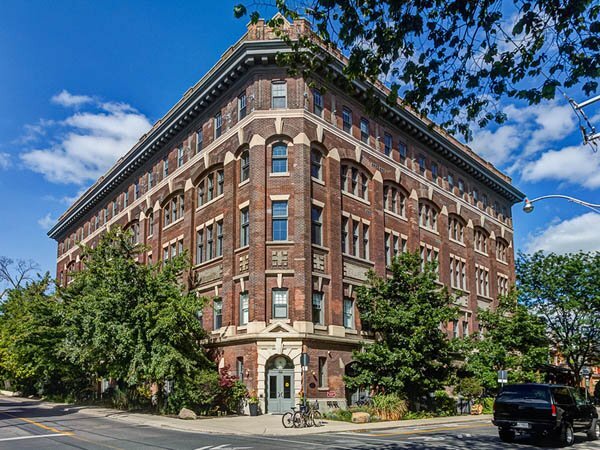 The south building was built first, in 1915-1916 and the north building, where the lofts are, was built in 1916-1917. If you don’t believe me, the proof is in the maps. The 1913 Goad’s Fire Insurance Map shows no buildings on the site, while the 1924 map does. That and there are tons of photos documenting construction in 1915, 1916 and 1917. 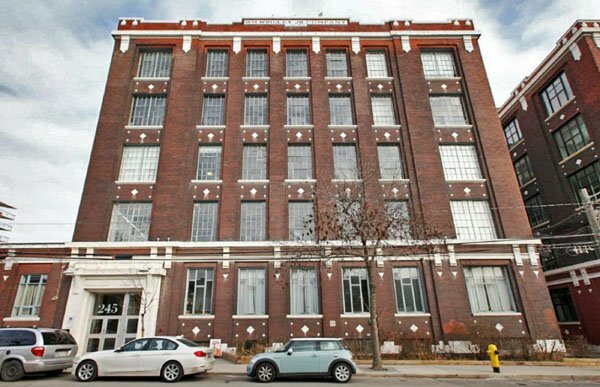 The old factory buildings at 235 and 245 Carlaw Avenue were known respectively as Wrigley Building A & Wrigley Building B. The first building at number 235 is identical to 245 except the ground floor is red brick. 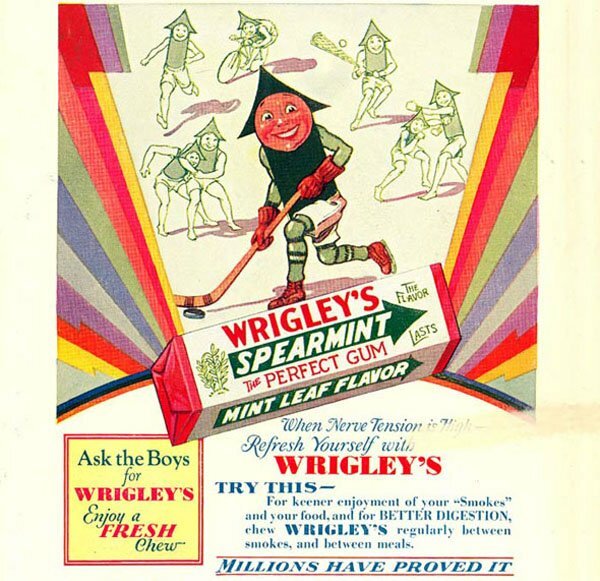 Wrigley chewing gum might be most commonly associated with America (in particular Chicago and Wrigley Field), but the company has deep roots in Toronto. This was the first place its founder William Wrigley Jr. opened a factory outside the U.S.
William Wrigley Jr. was born in Philadelphia in 1861. A natural if initially wayward salesman, he ran away at age 11 and briefly sold newspapers in New York City before returning home and being expelled from school for pulling pranks. 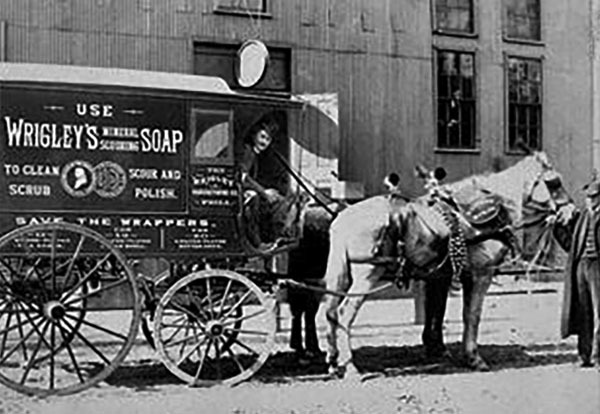 As a teenager he worked as a traveling salesman for his father’s soap company. 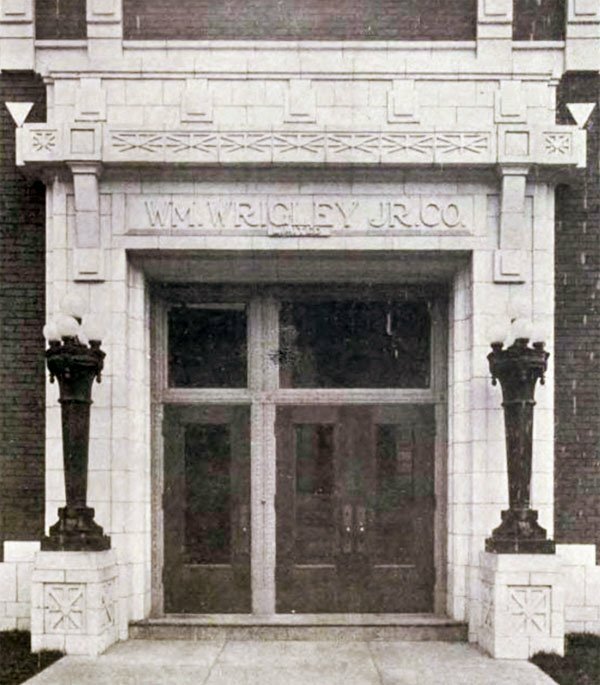 The William Wrigley Jr. Company was founded in Chicago in 1891 a few years after an unsuccessful attempt at selling rubber stamps. At first Wrigley sold soap and baking soda, offering incentive gifts to customers who bought in bulk. But giving away free prizes occasionally backfired. Giving away free packs of chewing gum proved to be much more successful. So, Wrigley quickly directed his prodigious energies toward producing his own line of gums. Early on, Wrigley paid candy maker Zeno Manufacturing Company to produce two products he helped develop: Juicy Fruit and Spearmint. 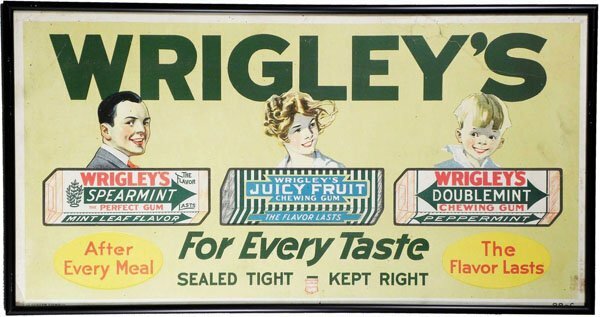 Juicy Fruit was Wrigley’s first product with Spearmint following a few months later. 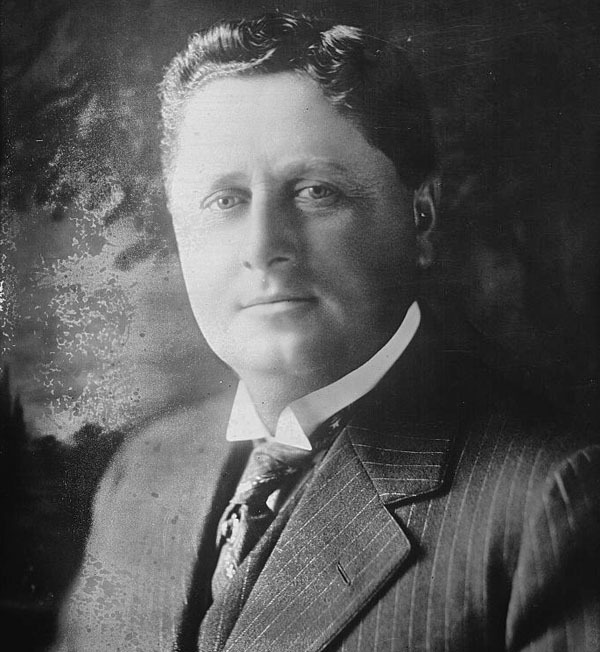 In 1893, Wrigley bought Zeno and re-branded it as the William Wrigley Jr. Company. Rumour has it that J. W. “Joe” Flavelle, an old childhood friend of Wrigley, had a hand in founding his friend’s gum company. 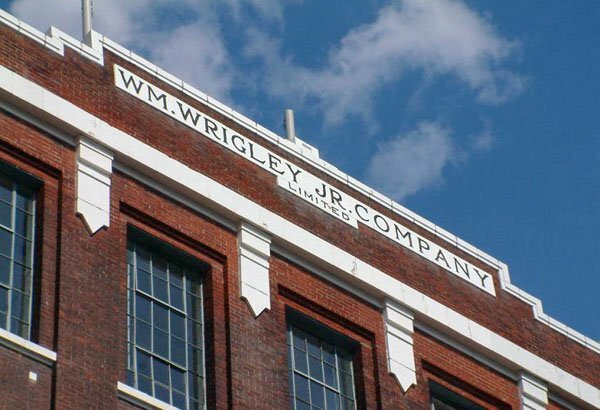 When a debilitating economic downturn arrived in 1907, Wrigley did the unthinkable, mortgaging everything he owned to launch a massive advertising campaign, a move that skyrocketed the company into national prominence and set the stage for the company’s future groundbreaking advertising strategies. And then he expanded. 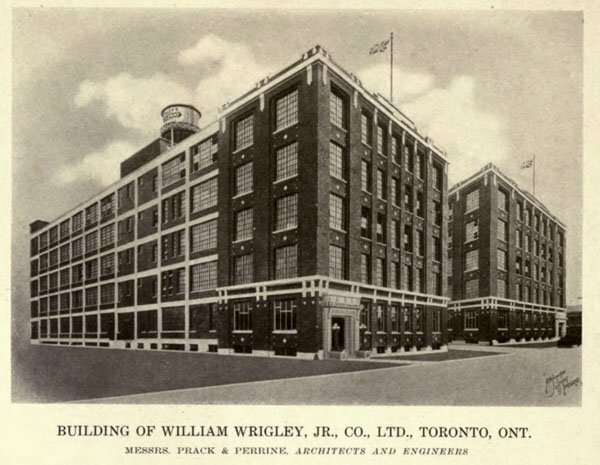 In 1907 or 1909 (opinions differ), Wrigley made his first foray outside the U.S. when he opened a small factory at 7 Scott Street in Toronto (now the site of the St. Lawrence Centre for the Arts). 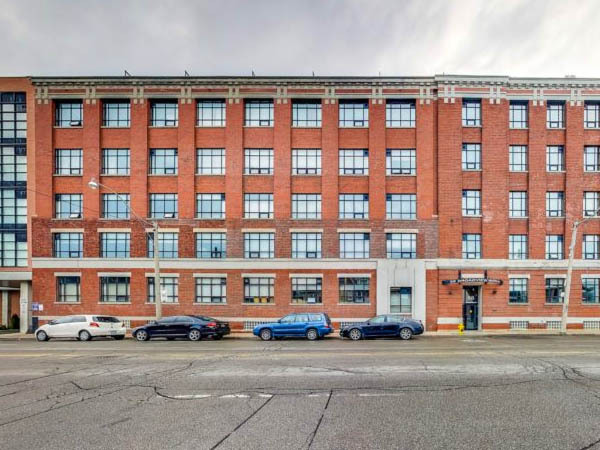 The 5-storey building was in the heart of the city’s manufacturing district, but the location was only temporary. In 1914 Wrigley’s introduced Doublemint. 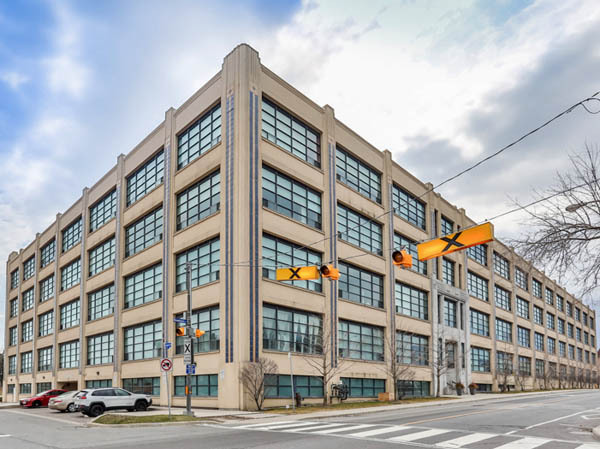 The same year, Wrigley’s obtained building permits on newly purchased land on Carlaw Avenue and announced that they would soon put up a brand new, state-of-the-art factory to make gum. The south building was the first part of the Wrigley complex and it was finished in January 1916. The vacant field to the north will be where its twin, the north building, would begin construction in the fall of 1916. This was a HUGE project. 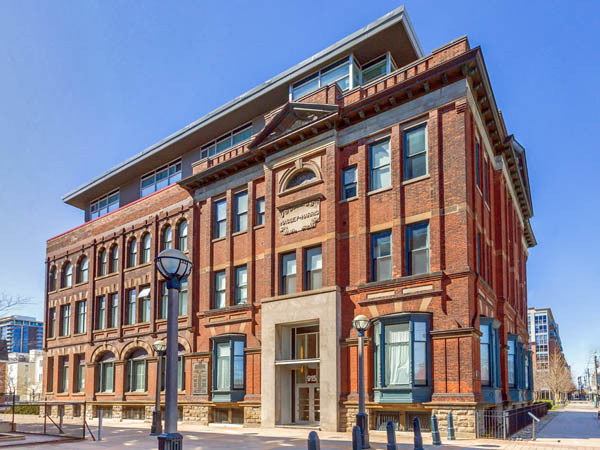 This was a major building project and Wrigley’s was destined to become one of the largest employers in the Leslieville of that time. 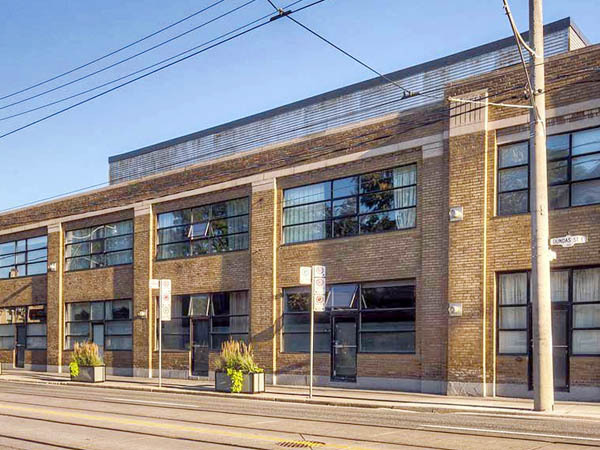 Wrigley expanded its Carlaw plant to 11,892 square meters when it finished the new building north of 235 Carlaw. 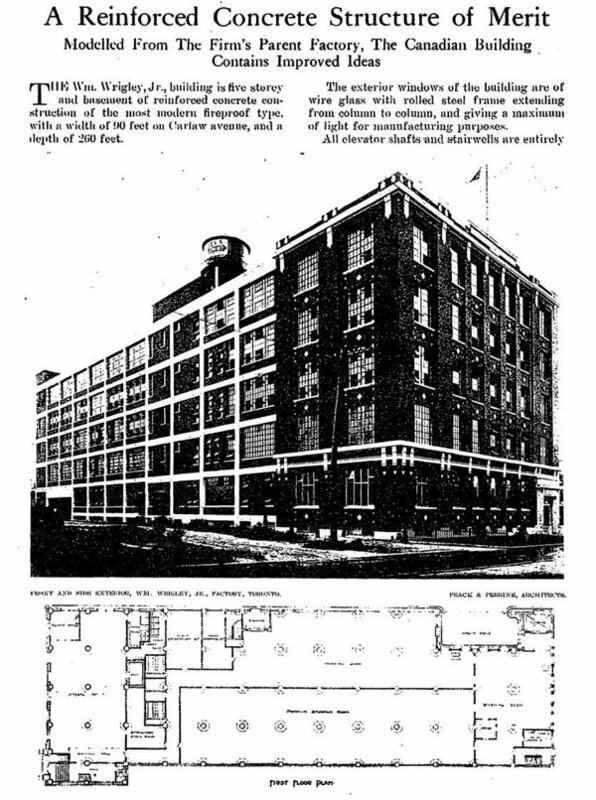 The new plant was finished in 1917. 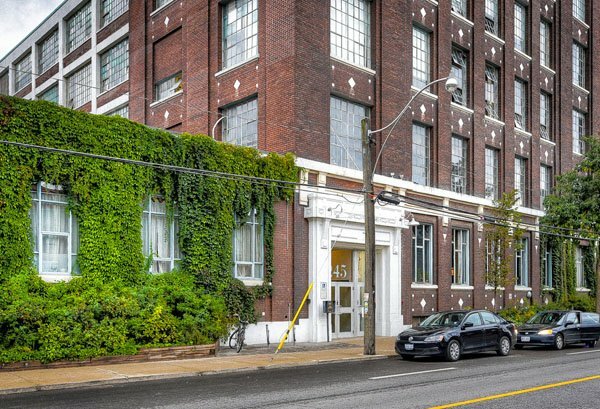 Pract and Perrine, the architects for 235 and 245 Carlaw, were also responsible for the Palmolive Building across the street. 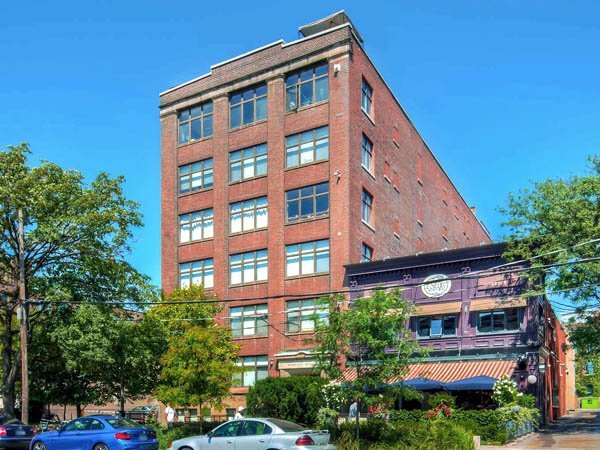 In 1918 Wrigley Canada built a private fire hall, at 87 Boston Avenue, to service its factory. It is now a private residence – and I love it. The manager of the Canadian operations was James Allen Ross. The products made in Toronto for the Canadian market included Doublemint, Spearmint and Juicy Fruit. As he had before, Wrigley offered wholesale customers a dizzying array of free gifts. Everything from a 16-inch talking doll, watches, electric irons, Kodak cameras to filing cabinets and even oak tables. The more gum they bought, the better the gifts. – British American Wax Paper Co. Ltd.
– Dunlop Tire Rubber Goods Co.
– A. Stein & Co.
– American Wax Paper Co.
– Blachford Shoe Manufacturing Co. Ltd.
– Delco-Light Co. of Canada Ltd.
– Hammond Co. of Canada Ltd.
– Lambert Pharmacol (Canada) Ltd.
– T.E. O’Reilly Prophylactic Brush Co. The company was also a prolific advertiser. Most ads printed in the Toronto papers centred on gum’s purported health benefits. Chewers could expect more energy, better digestion, even reduced thirst. In the 1930s, a giant neon Spearmint sign was located on the roof of the Stollery’s building at Yonge and Bloor and there were ads across the TTC. “Spearman”, a sort of half-man, half-arrow creature, became the company mascot, appearing in countless promotional situations – even a version of the Mother Goose fairy tales that was handed out in schools in Toronto. 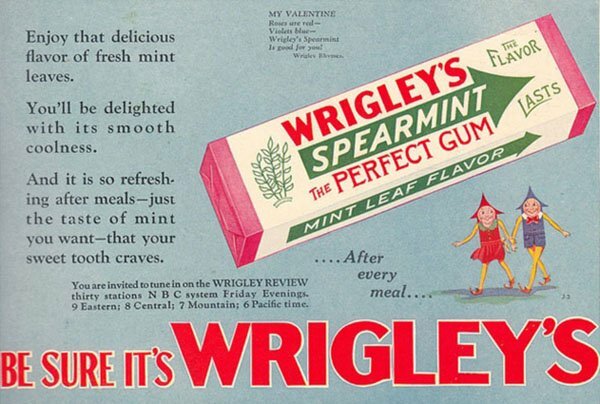 After the Second World War broke out, Wrigley sold all its gum production to the military while running an ad campaign asking people to remember their product and buy again when peace came. 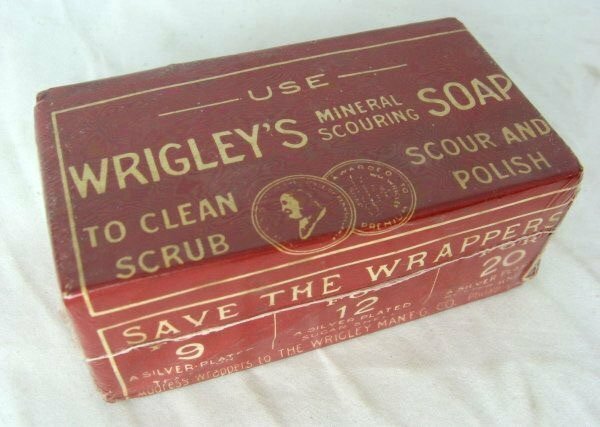 Wrigleys’ gum was a standard item in the Red Cross parcels that went to prisoners of war, saving many lives. The parcels were packed in special boxes made where Gerrard Square is today. 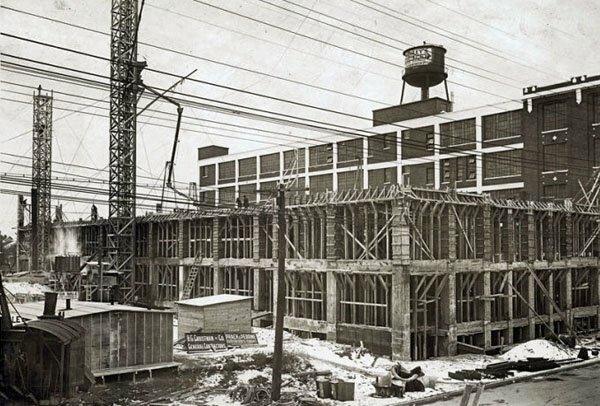 Wrigley’s was a good corporate neighbour and a good place to work through the decades after World War II, but by the early 1960s it needed more room to expand and to modernize its operations. 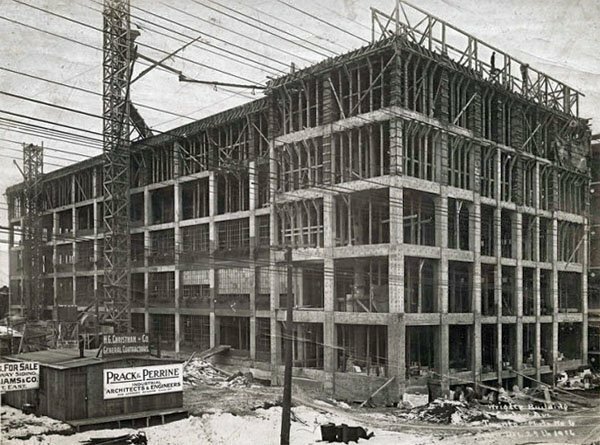 In 1963 Wrigley Canada moved from Carlaw Avenue to a new plant on Leslie Street north of Eglinton. 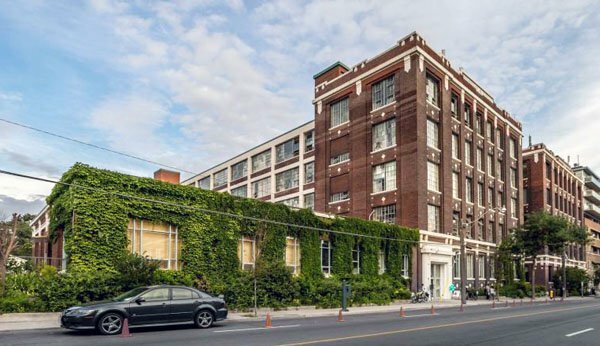 The Leslie plant closed in 2016, ending Wrigley’s presence in Toronto after 108 years. 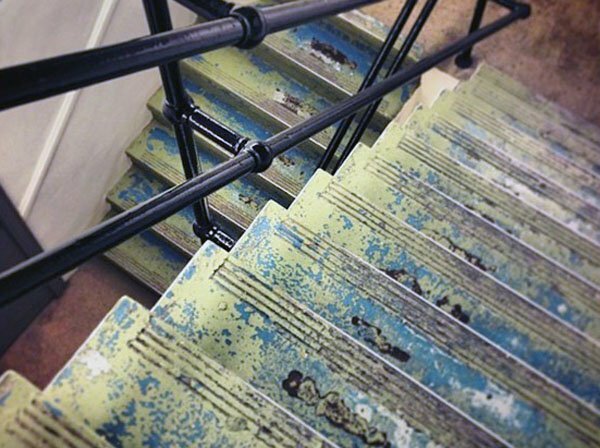 You can see echoes of the old factory in the current lofts – this could almost be the same area as in the shot above! 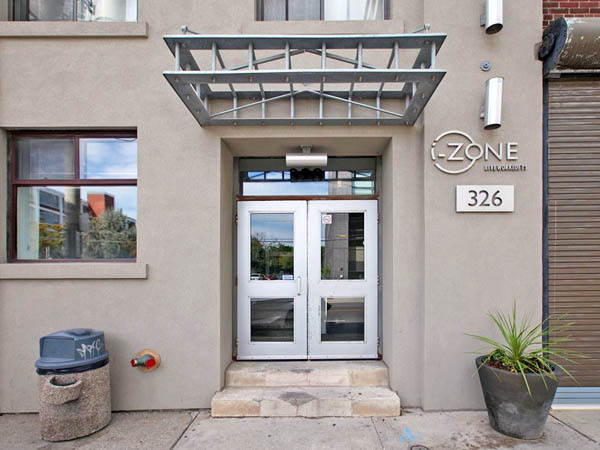 At the southwest corner of the intersection, the entrance to the cafe and bar on the corner of the i-Zone Lofts, is at a strange angle for the same reason. 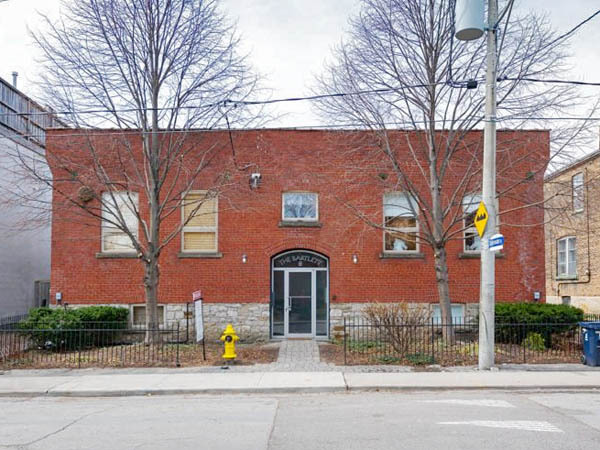 An industrial building on Thackeray St., north of Dundas, likewise has rounded edges on two of its corners to accommodate that trains that ran through here until the 1990s. The effect on the architecture of the area is most apparent from the air. 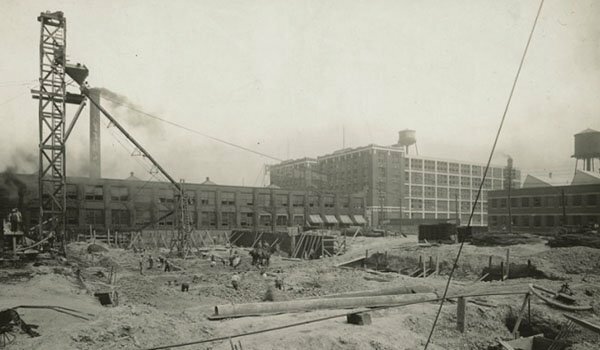 The Palmolive building under construction, with the Wrigley factory and Rolph Clark Stone plant in background in late 1917 or maybe even 1918. The Philips plant (picture frames) is belching smoke to the north. 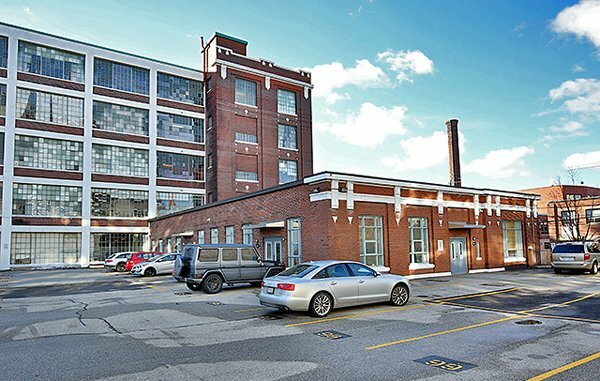 Carlaw was rapidly becoming the industrial heart of the area. The area began with produce, oddly enough. The 1850s to the 1870s were the height of the market gardening industry in the Leslieville area. As the population grew with immigrants arriving from Britain, the demand for farm products increased significantly. Kingston Road allowed produce to be easily transported to market and the arrival of the Grand Trunk Railway in 1854 provided access to wider markets for the local farmers and market gardeners. As the demand for market garden produce grew, new technology was adopted to expand yields, and the industry became established in the area. 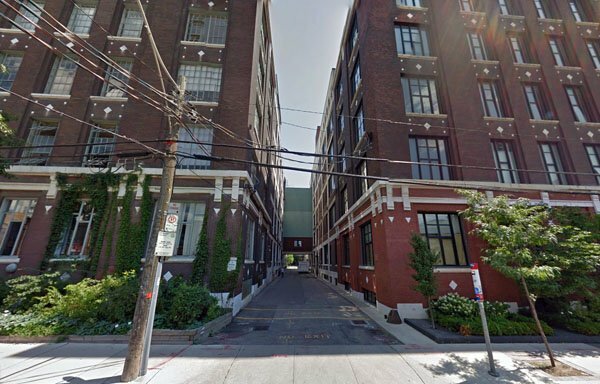 Rear of the Wrigley buildings, with the rail spur is behind the fence – can you see the rail cars by the south building? Rolph Clark Stone is in the background. The market gardeners in the Leslieville area were small-scale producers of vegetables, fruit, flowers, bedding plants, exotic plants and shrubs and trees. For the most part, they sold their produce directly to an established customer base. Some sold to stores and at the St. Lawrence Market. A number were African Americans who had arrived in Toronto using the Underground Railroad network also operated market gardens in the area. 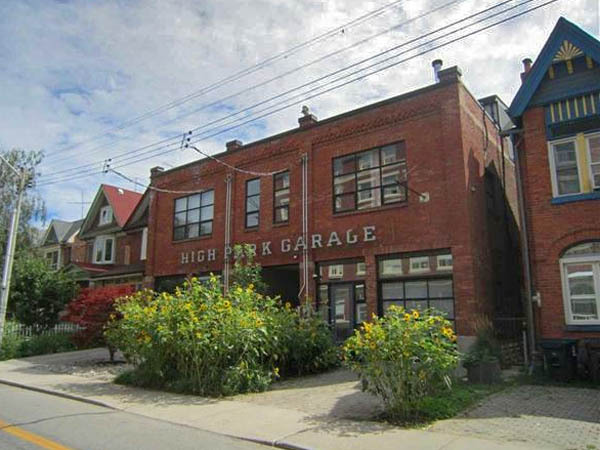 Two prominent streets within the Carlaw and Dundas district, Pape Avenue and Logan Avenue, were named after local market gardeners. Joseph Pape (1815-1889) was one of Canada’s first florists and John Logan (1828-1905) owned a prominent market garden business. To the east of the district, George Leslie established the Toronto Nurseries in 1845. 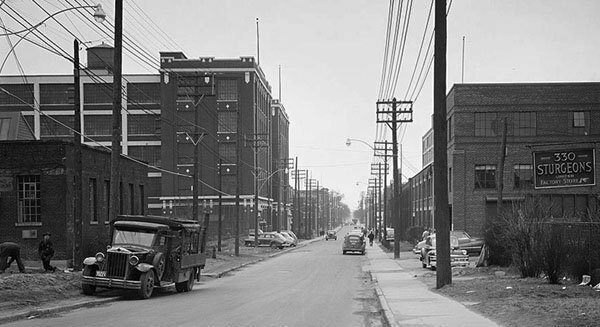 Looking south on Carlaw from Dundas in 1948. 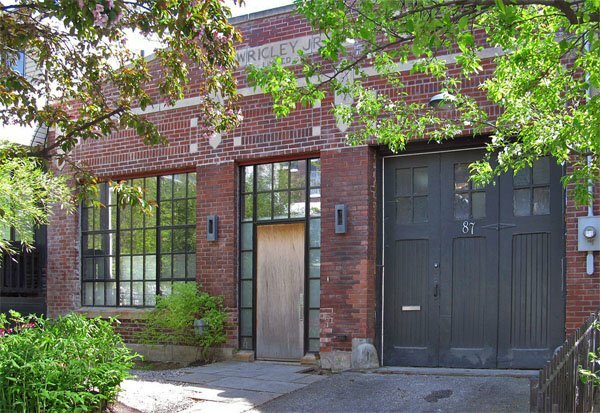 Wrigley on the left, Sturgeons paint and varnish at right, the knitting mill that became i-Zone south of that. 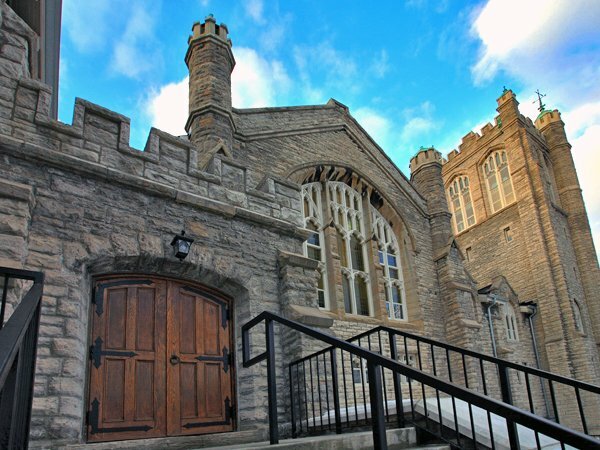 Carlaw Avenue was named for Scotsman John A. Carlaw, the cashier or controller of the Grand Trunk Railway. He formed and led a contingent of Grant Trunk Railway employees to fight the Fenians when these Irish patriots invaded Canada. 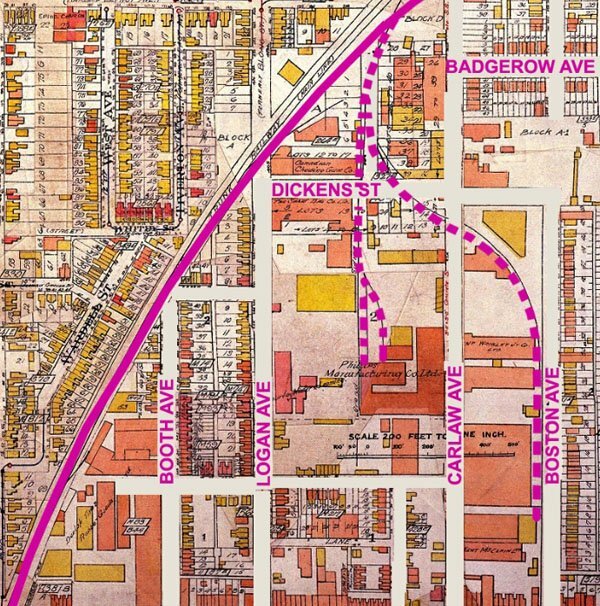 In 1874 the City of Toronto gave the name of Carlaw Avenue to the new street south of Eastern Avenue to the Bay between the Gorrie property and the Heward property south of Eastern Avenue. It was also called Gorrie Street from time to time. Major John Carlaw did not own extensive property in the area and it seems likely that the street name was to recognize Carlaw’s leadership of the Grand Trunk Railway Brigade Volunteer Artillery Fourth Battalion. Gardening faded as a business and by the 1890s, over half of the area comprising Leslieville was used for brick making, or had been a brickyard. Brick making was now the largest area employer. During this period, brick manufacturers started to build new and more industrialized kilns. This new technology allowed them to produce several million bricks a year. 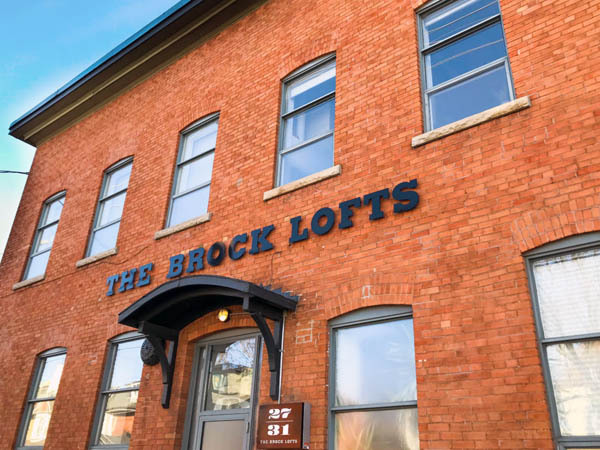 By the end of the 19th century, and into the 20th century, brick was a very desirable building material. 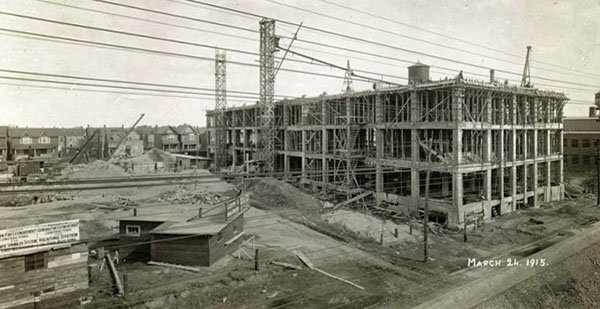 The Leslieville brickyards supplied the brick needed to build many commercial and residential buildings in Toronto and area. 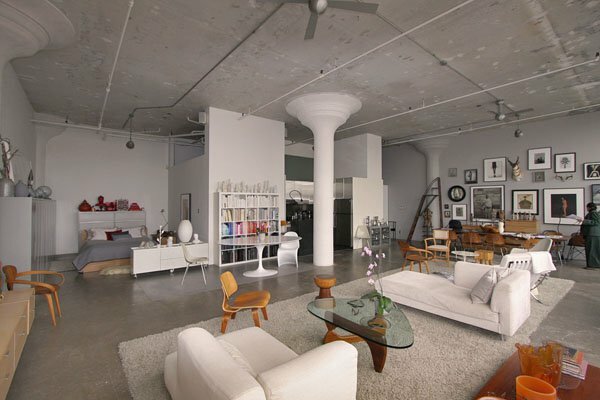 Not a lot of exposed brick in the Wrigley Lofts, but there is a ton of concrete! 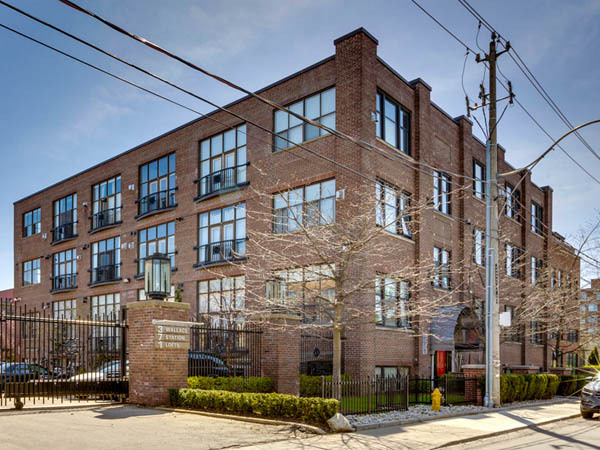 As hydroelectric and water and sewage services were extended to the area in the early 1900s, the former brickyards were redeveloped for new industrial and associated uses and associated works’ housing. By the 1920s, due to an increased demand for bricks and the mechanization of the production process the Leslieville area brick fields were depleted and the clay beds were covered by redeveloped land. During the Great Depression, there was little demand for bricks for building projects. 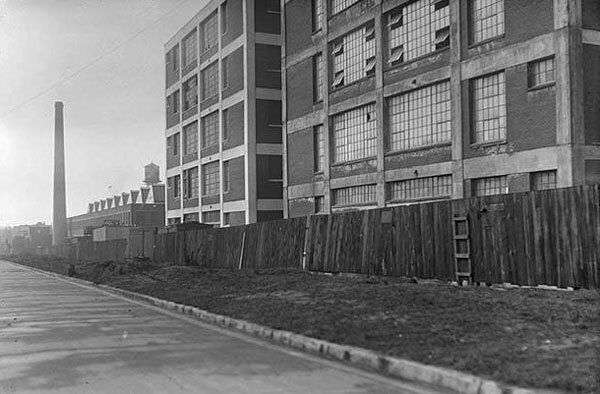 The land around the factories was developed with predominantly low-income residential housing for industrial workers. 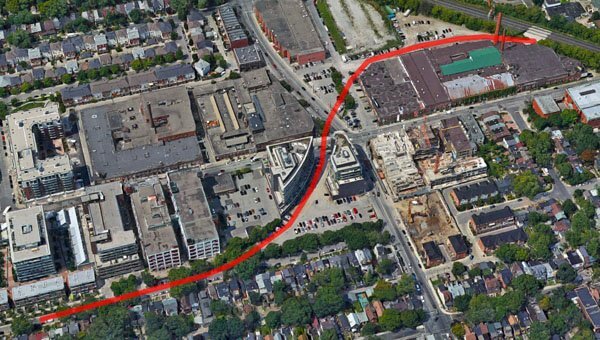 The proximity of the local housing to the factories created environmental concerns in the Leslieville area as pollution from the factories began to contaminate the soil and water in the area. The 1920s brought prosperity to the area. However, this came to an abrupt end with the crash of the stock market in 1929. 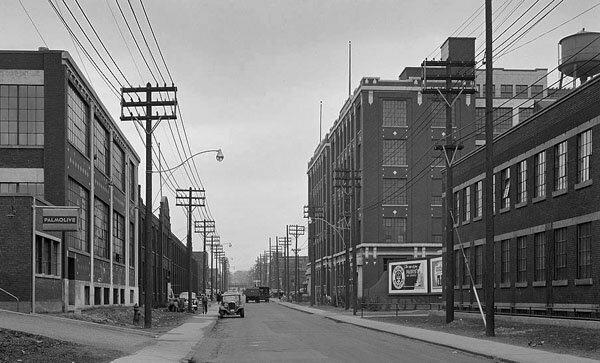 Many factories in Leslieville closed down and the unemployment rate rose. People from rural areas and other parts of Canada came to Toronto looking for work. 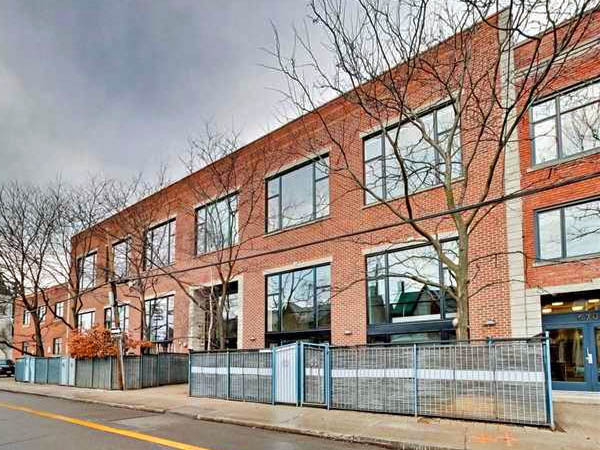 The flood of workers and their families worsened the housing crisis in Leslieville. The area became crowded and rundown. In the 1930’s there was a huge campaign for the introduction of social welfare, including better housing conditions in the area. 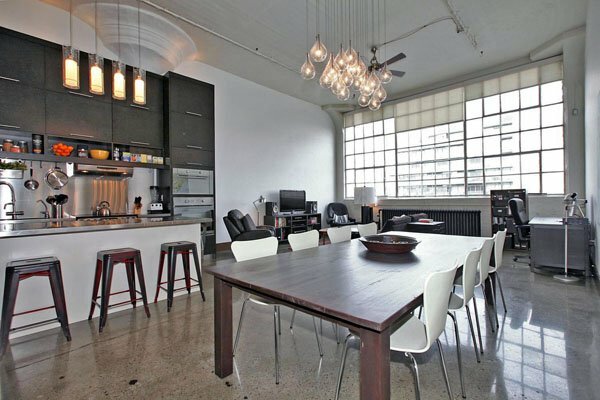 Speaking of better housing, where are you going to find a better loft than the Wrigley Lofts? The Second World War ended the great depression. Industrial production in the area once again flourished. 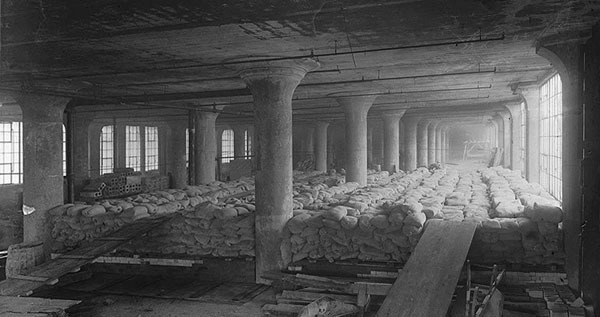 Woods Manufacturing on Logan Avenue produced uniforms and tents for the British and Canadian armies, for example. Although the war ended unemployment, it worsened the housing crisis in the area and existing housing began to deteriorate. In the decades after the Second World War, with a decline in local manufacturing employment, many industries left the area. This resulted in further deterioration. 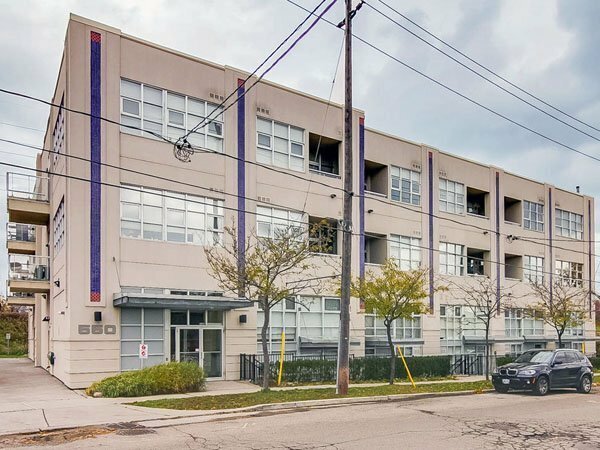 In the 1980s, NAFTA caused Canadian branch plant industries to suffer, forcing more industries to leave the Leslieville area. 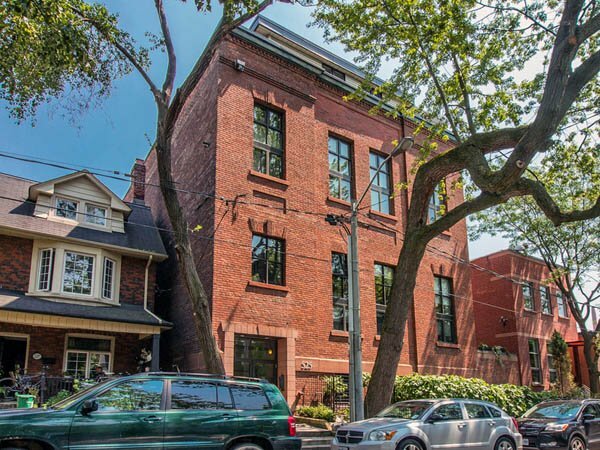 Then, starting in the 1990s and into the 2000s, Leslieville began to experience a resurgence as young professionals moved into the area because of affordable houses and proximity to downtown Toronto. 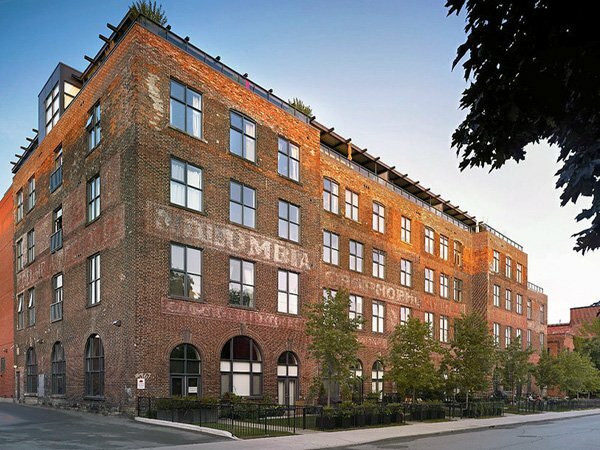 Old factory buildings in the district such as the Wrigley gum factory and the Rolph Stone printing plant were converted into desirable lofts.